Of all the materials that I steer clear of in my work, gemstones are the ones I miss the least. In most cases, the qualities that we find appealing about stones can be captured in other ways. 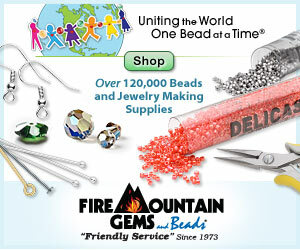 With the huge variety of sustainable beads available, I’m never wanting for color, shape, or sparkle. There is one gemstone, however, that I have never seen emulated in glass. 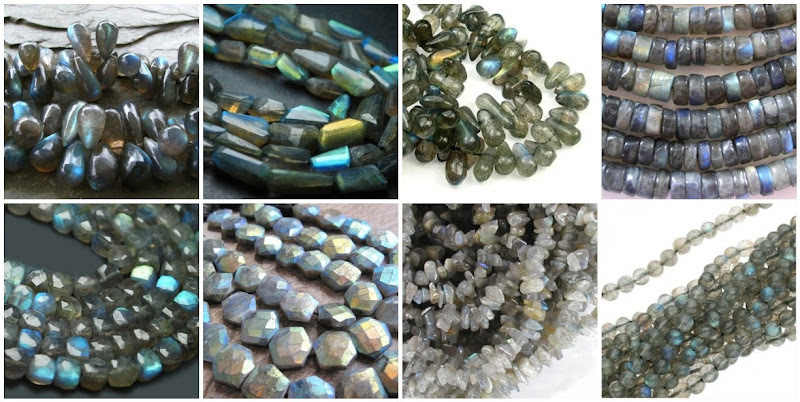 Labradorite is so stunning, that I do have a bit of envy for designers that use it. The unique, smoky color with it’s tiny flecks and flashy shine is almost irresistible. One look, and you feel like you could slide right into the stone and disappear. Labradorite is a feldspar mineral, and is often found within igneous rocks such as basalt. It goes by many other names, such as spectrolite, black moonstone and falcon’s eye, depending on it’s color, and where it is mined. It is found in abundance in Newfoundland and Labrador in northeastern Canada, as well as Finland, Mexico and Madagascar. According to Inuit legend, labradorite is the Aurora Borealis, or northern lights, trapped in stone. It is considered a good luck stone, and has been used for charms and luck jewelry since the 18th century. Some also believe that labradorite increases clairvoyance. Do you like to use Labradorite in your work? What do you like most about it? I have a few tumbled stones that I've used for my own healing, but have never used it in jewelry. But from these pics it looks like I should! 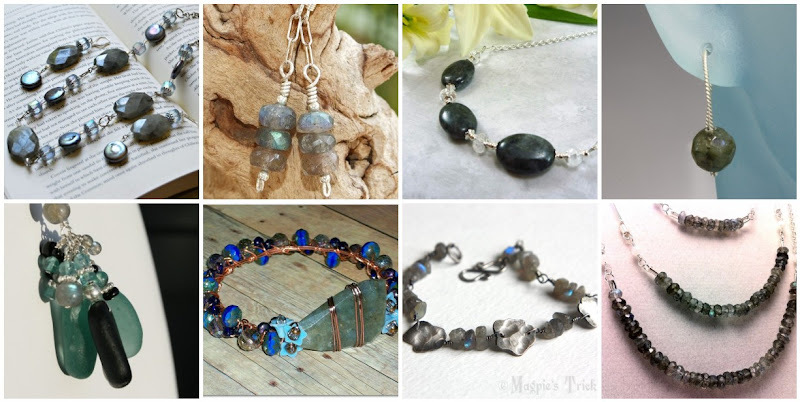 Thank you so much for including my sea glass necklace in this beautiful collection of labradorite treasures. You have a fabulous blog! Labradorite is definitely one of my favorite stones to look at. It is so mysterious and mesmerizing. I love how it changes in the light. Very well written and informative article, thank you for including my necklace! My daughter made a beautiful rosary for her cousin using Labradorite in different sizes. It is beautiful and very unique. I also love labradorite - ancient Roman glass reminds me of it. Now - we just need some fabulously talented glass artist to figure out how to make a stable glass that has that multi-layered crystal quality - not like dichroic or cats-eye but subtler and smoother and less . .. predictable. I adore labradorite and your description of the stone capturing the Aurora Borealis is spot on!!! I use it to give a subtle flash in designs that have texture and matte finishes. My favorite piece of jewelry is a beaded bead necklace using labradorites. I used 5 beaded beads spaced equally on a sterling silver chain. Simple and elegant!! I absolutely love labradorite but I didn't always like it. It was one of those stones that sort of grew on me over time and no I adore it. The main reason was that I did not know how to use it in designs but after seeing some very talented jewelry designers use it, I was inspired. My fave stone by far. Love it organic shape with no fire and love it all faceted, flashy and fiery! I have several handmade jewelry pieces made with labs and I reach for them more often than anything else. Very nice post and pics...learned some new things about labradorite too. Not only would I love to use labradorite but gemstones in general. For a starving college student gemstones are expensive. Fortunately I do have some quartz that I need to touch every time I see them, I just get so excited that I own them. You have a wonderful blog, and eventually I would love to want to be featured. I've never used labradorite, but looking at your lovely examples I'm thinking I should look for some! A really good blog about one of my favorite stones! I think that every piece I have ever made from laboradite has sold almost as soon as I made it! It is so pretty!